27. At Aïn Kebira Satifis, CIL 8.20277 Diehl (1925-31) 1.301 no. 1570; among many mentions, cf. Iosi (1924) 105f. In the inscription "mensa" is taken in the sense of a building, whereas, as I've explained, the alternative and older meaning of "table" is what I favor. insuper ar(a)equ(e) deposit(a)e Secundulae matri. ipsa [q(uae)] nutri(i)t, iaces, et sobria<e> semper! V(ixit) a(nnis) LXXV. A(nno) p(rovinciae) CCLX (= p. Chr. 299). Statulenia Iulia fecit. Carmen acrosticum est simulque telestichium; primae et ultimae versuum litterae efficiunt verba fili dulci simae matr. — 6 copertae videtur dictum esse pro coopertoriis, et significari vestis stragula. 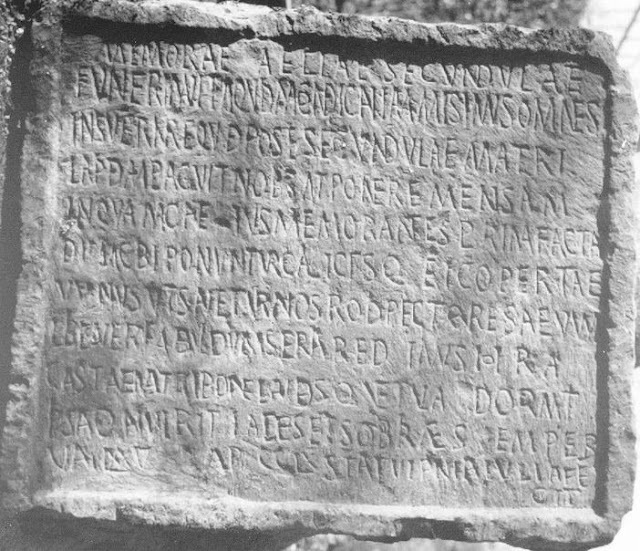 I learned about the inscription from Johannes Quasten, "'Vetus Superstitio et Nova Religio': The Problem of Refrigerium in the Ancient Church of North Africa," Harvard Theological Review 33.4 (October, 1940) 253-266 (at 257).